Framing beautiful views through the window can improve your interior home design and give your space the point of interest it may lack. However, you need to be thoughtful with your window installation to take advantage of your neighboring landscapes. First of all, understand that not all views are equal. 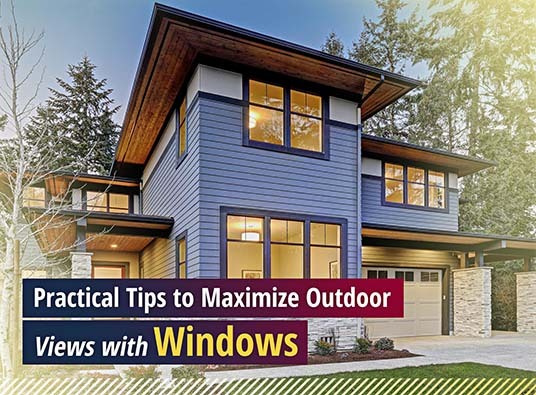 Windows that face unsightly outdoor features wouldn’t deliver desirable results. You have to be strategic with the locations of your glass units. Identify attractive elements and make every effort to bring them inside. Plus, use your windows to provide surveillance to the perimeter of your home. Other than location, size is equally paramount. No other style captures wonderful panoramas better than bay and bow windows. These projection units comprise multiple glass panels, allowing them to bring in expansive pieces of the outside world. If installing large units isn’t an option, arrange several windows together instead. Their collective glass surface could match that of a single bay or bow. Before you let your imagination run wild, though, think about your home’s architecture before deciding on a window combination. A bank of three windows or a pair of corner units isn’t always consistent with the aesthetic of some architectural styles. Scrutinize the type of glazing of the product. Some glass options tend to be dark in hopes of blocking the sun’s infrared and ultraviolet rays, sacrificing the clarity of the view. One way to tell if the replacement windows could provide vibrant outdoor snapshots is by looking at their Visible Transmittance rating on the NFRC label. While it measures how much light could pass through the glass, it could also determine how colorful the view would be. Let Kroll Construction help you plan your window replacement project to make the most of your outdoor views. Call us at (888) 338-6340 today to schedule your FREE, in-home consultation in Detroit, Michigan, at your most convenient date and time.